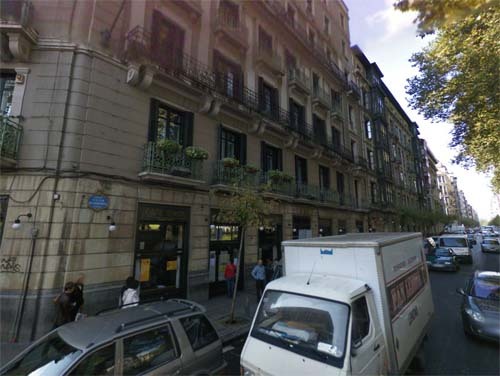 Café Iruña is a Cafe loacated at Calle Berástegui 4 in Bilbao, Spanien. 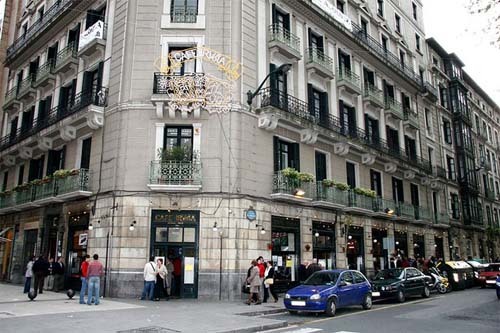 The Café Iruña opposite popular Albia Gardens, was opened on July 7, 1903. Draws attention to the original distribution of its 300 square meters of floor space divided into different in highlighting the quality of its singular tiles and Moorish-inspired decor, with polychrome ceilings and a rich collection of murals, which has been restored recently. With its enviable location, the extent of their large rooms, the variety of its “painstaking hotel services” (in the words of Unzue Severo) and especially their continued dedication to the revitalization of the socio-cultural, fun and festive, the Iruña Café is very populair for many locals. 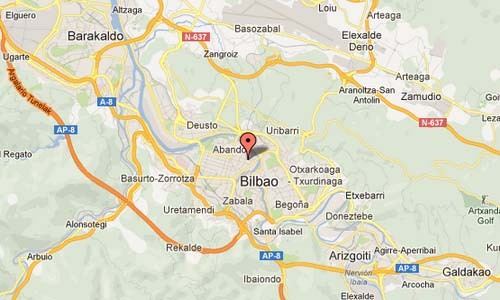 The Iruña (Pamplona in Euskera), an essential Bilbao haunt on the Ensanche’s most popular garden and square, Los Jardines de Albia, is famous for its decor and its boisterous ambience. 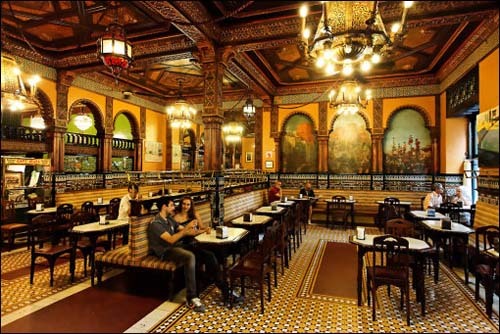 The neo-Mudéjar dining room overlooking the square is the place to be (if they try to stuff you in the back dining room, resist or come back another time). The bar has two distinct sections: the elegant side near the dining room, and the older, more bare-bones Spanish side on the Calle Berástegui, with its plain marble counters and pinchos morunos de carne de cordero (lamb brochettes) as the house specialty. (www.fodors.com).